Anara Spa’s setting is amazingly blissful. Stone paths lead you past tropical gardens filled with blooming ginger, palms, ferns, and plumeria. Your mind is put at ease by the sounds of waterfalls cascading over lava rock walls and tropical birds. You’ll enjoy sipping fruit-infused, chilled water while waiting reclining in an open-air, thatched roof hale (bungalow) before your spa treatment. It’s fantastic! A dreamy and sighful “aahhh” comes to mind when I recall my recent experience at Anara Spa. I loved it! If you are looking for a special spa experience on your Kauai vacation, I highly recommend you check out Anara Spa. Anara Spa offers a wide range of spa treatments from massages and body treatments to facials. Treatments are offered either in “indoor-outdoor” rooms with a little bit of an open-air element or in the garden spa area with thatched roof hales. 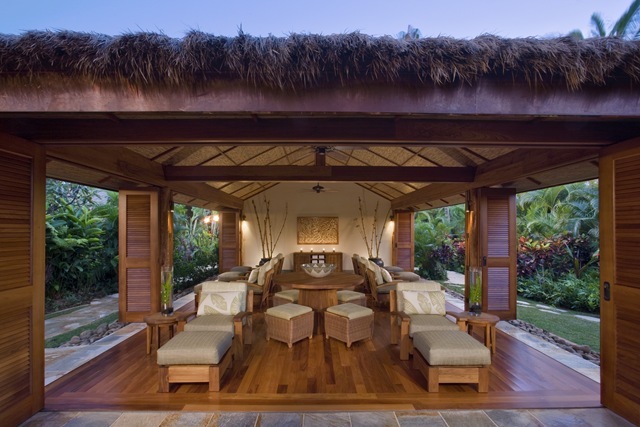 I opted for the 50-minute Hawaiian Lomi Lomi Massage in an outdoor private hale ($160). The massage was excellent. Before your spa treatment, you can take advantage of the spa’s unique amenities spread across this 45,000 square foot spa. The spa offers a lap pool, whirlpools, outdoor lava rock wall showers (see my iphone photo) , soaking tubs, sauna, and steam room. They even have a 12-head shower that’s fun to try. It’s like being in a car wash. After my visit to Anara, I told my husband, Andy, that I’ve probably never been cleaner in my life with all the different showers I tried. Some spas have snooty staff, but you won’t find that at Anara Spa. Anara’s staff is very helpful and welcoming. I was warmly greeting when I arrived and led to the women’s locker area, where I was given an orientation to the spa and facilities. Review Anara Spa’s website which describes their spa services and prices. Anara Spa is located at the beautiful Grand Hyatt Kauai Resort in Poipu (Koloa) at 1571 Poipu Road. If you are not a guest of the hotel, you can self park in a large parking lot on the left near the entrance of the resort. Valet service is also available. Aim to arrive at least 30 minutes before your appointment to take advantage of the steam room, sauna, whirlpool, lap pool, showers, etc. I thoroughly enjoyed the Relaxation Hale, so make sure you leave time for that. Bring a swimsuit if you’d like to take advantage of the lap pool, whirlpools, etc. Want a deal at Anara Spa? Who doesn’t! Check the Grand Hyatt Kauai twitter stream or their facebook page for the latest spa deals. Have you been to Anara Spa? How was your experience?